Rocrail is a Project that can control a model train layout from one or more computers. You can run trains directly from your computer, and you can have the computer run trains automatically for you. You can even have some of the trains on your layout running automatically while you control others by hand. 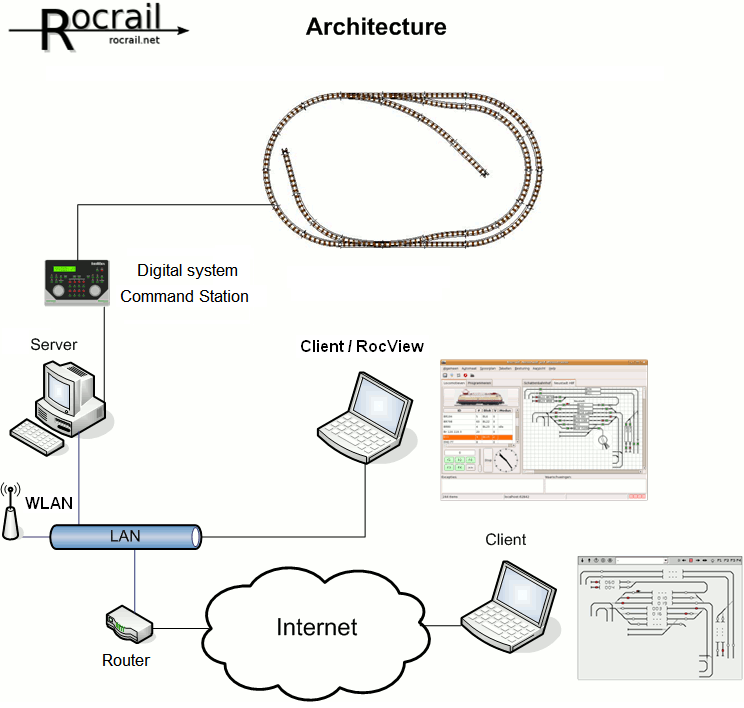 The Rocrail Server (Rocrail) runs on a computer connected to the layout by one of the standard computer interface setups, and supports many controllers such as Märklin's 6051, the Uhlenbrock Intellibox, Loconet, SRCP connections such as DDL/DDW and more. See the complete list of supported controllers. The Rocrail Client (Rocview) connects to the Server over your network. Rocview can also be used by itself to plan layouts. You do not need the Server or the layout to be running to edit your plans. Plans can be uploaded to the Server after you are done creating them. And Rocrail runs under Mac OSX, Windows and Linux.